Keep track of lessons, teacher hours, income and expenses all in one place. TutorPanel keeps data entry to a minimum to save time and reduce clerical errors, plus it lets you give students and parents access to their own lesson and billing information. Information for all of your current and former students is right at your fingertips including parents, contact information, date started, birthdate, school, subject, grade, additional notes. 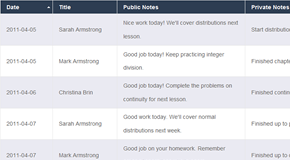 Plus a full history of all lesson notes comes in handy when switching teachers or when a former student signs up again. Use our bulk upload to quickly add your students. 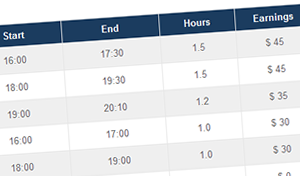 Automatically track tutor hours based on tutor's reconciled lessons. Instead of collecting time sheets from your tutors, TutorPanel will automatically keep track of the number of hours they have taught. 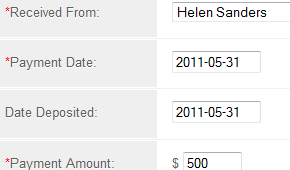 You can also record wage payments to tutors and can view how much wages are due at any point in time. Charging fees & credits is as easy as filling out a form. After recording a fee, students and parents can view a detailed description in their accounts and it will automatically be included in the student's next invoice. With information being this accessible you'll spend less time on the phone answering questions about billing. 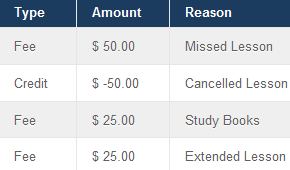 Keep track of student payments. Record student, payment date, deposit date, payment amount, payment method and notes. 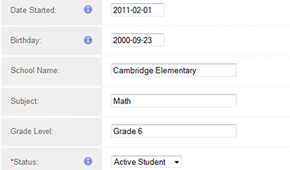 Students and parents can quickly check their accounts to see that you have received and recorded their payment. Have quick access to all lesson records. Teachers can record public notes that can be viewed by students and parents in their TutorPanel accounts, and private notes for their own records. Lesson records also include lesson cost and whether the lesson was attended, cancelled, missed or rescheduled. TutorPanel helps you stay on top of your business expenses. You can record expenses manually or set up a recurring expense schedule for your business expenses that repeat. 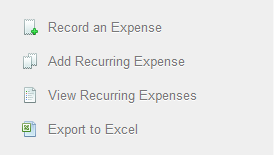 Plus you can export your expenses to excel at the click of a button. With TutorPanel you can easily export your financial transactions, student information, lesson notes, tutor hours and more to Excel. 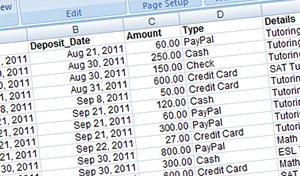 Exported records can be processed in Excel, imported into other programs like Quickbooks or saved as a backup. 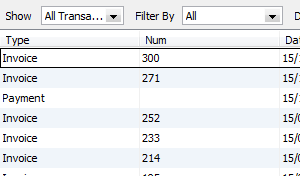 If you use Intuit QuickBooks for credit card processing or accounting, you can quickly export payments and invoice totals from TutorPanel into an IIF file for import into QuickBooks. Parents & Students can view past lessons and transactions online.